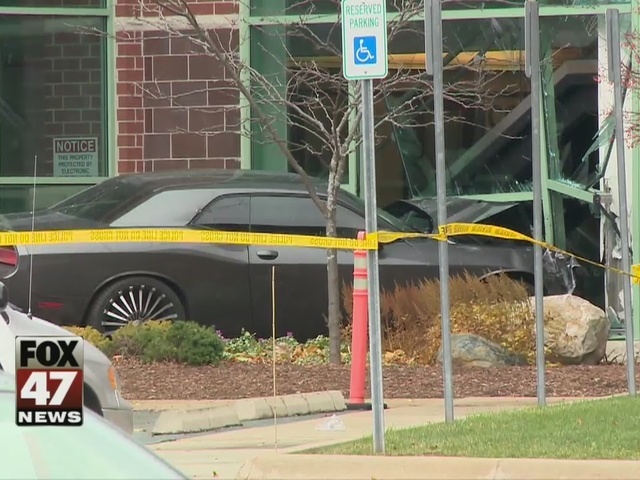 One man is in custody after ramming his car through the Mid-Michigan Physician building on Wednesday, injuring two people in the process. One witness who watched police arrest the suspect says the man seemed very disturbed. "Yelling 'kill me, kill me' he was completely belligerent just flailing arms and making aggressive gestures," said Chris Draper, recounting what the suspect said as he approached police who had their guns drawn. Draper saw it all happen as he was running to his car. He had an appointment at Mid-Michigan Physicians and says initially he thought someone was shooting up the building. "Your first reaction when you hear all that bangs is it sounded like gunfire, and fortunately it wasn't," Draper said. As it turns out police say the sound was from a man driving his car through the front door, then reversing and crashing through the lobby window. Draper says the officers who responded showed what he called "incredible restraint." "They definitely subdued him very quickly, but in a very professional manner," Draper added. Since the investigation is on-going, police aren't saying much about the incident. "He was on foot when the officers arrived and they were able to subdue him and take him into custody," said Lansing Township Police Chief Kay Hoffman. One witness who was in the parking lot when the incident happened and tells FOX 47 he saw a person get pinned by the car when it drove through the window. Police are confirming that two people were injured in the crash and were taken to a hospital for treatment. At last check those victims are in critical condition. "We're still very early in the investigation trying to find out really everything that happened and why it may have happened," Hoffman said. But Draper says the incident says could have been much worse, and he's just grateful the officers on scene were able to de-escalate the situation. "The guy was completely out of his mind," Draper added. Engineers are trying to determine if the building is structurally safe. Mid-Michigan Physicians will be closed at least until Monday. Patients with appointments will get calls to reschedule them. Stay with FOX 47 for more information as police finish up their investigation. *Note: Since the time this story originally aired, Lansing Township Police have corrected information they gave. They initially thought three people were injured in the incident -- they say only two were hurt.